Saint Charles Cemetery is located north of the Church on N. Dixie Highway. The purchasing of grave lots is open to people of all faiths. Staff and volunteers are responsible for the landscape planting and maintenance, setting foundations, and spring and fall clean-ups. 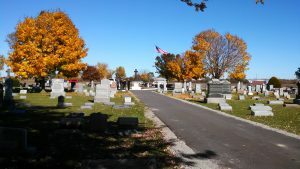 Cemetery clean-up occurs twice a year; the Saturday before Palm Sunday, and the last Saturday in October. All grave blankets, wreaths, flowers, etc. will be removed from the graves at these times. Please make sure that if there is anything that you want to keep or have remain at a gravesite, you will need to take it from the cemetery before the cleanup and bring it back after if desired. Contact the Parish Office if you are interested in purchasing lots or would like more information.